and one count of obstructing government administration. East Molloy Rd, town of DeWitt. and supercede local and Federal law. to resist drones at a number of bases. 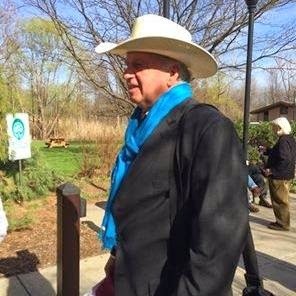 Hancock Show Trial #2: Vietnam Vet Drone Resister ACQUITTED! John Amidon: "Please join us March 4 - 6 to Shut Down Creech!" Shut Down Creech! is going to be the largest peace convergence Creech AFB has ever seen. VFP National is working very hard along with CODEPINK, VCN, and NDE. I am in Las Vegas now setting up special events. The soon-to-be Broadway play "Grounded" will be one of these events. Please join us March 4 - 6 to Shut Down Creech! . . . . and please share the VFP video (below) too. Labels: anti-drones protest, drone base, Shut Down Creech! to protest the use of drones by the military. In the second of a string of "show trials" aimed at quashing First Amendment activity in Upstate New York, after two hours of deliberation,Vietnam Veteran and Buffalonian Russell Brown, was acquitted July 31 by a six person jury in DeWitt Town Court, East Syracuse. He was facing charges of Obstruction of Governmental Administration (OGA), a misdemeanor carrying up to a year incarceration and up to $1000 fine, as well as Disorderly Conduct charge, a violation. Brown, who went before the court Pro Se (he served as his own counsel, was assisted by Buffalo Attorneys Daire Irwin and Paul Fallon. Russell Brown was arrested during a nonviolent protest at Hancock Air National Guard Base on April 28, 2013. In a roadway across from the Airbase, he lay down to symbolize the death of drone victims. There are biweekly demonstrations at Hancock Airbase. Several times a year there are larger demonstrations and nationally coordinated events. On six occasions there have been arrests, leading to six trials since 2011. Mr. Brown's trial is the second acquittal. There are twenty activists are facing prosecution, working with Upstate Drone Action. During testimony, Brown told what he did leading up to the "Global April Days of Action" gathering in Syracuse. This included his writing a poem that links the drone attacks conducted at Hancock with the missions he conducted in Vietnam. A marine from 1965 - 1967, he told of the war he experienced. His participation in senseless killing and brutality in Vietnam informed his understanding of the Drone War Program at the 174th Attack Wing. Russell now finds allegiance with the victims of the drone attacks. Laying on the street with "blood" spattered clothes lifted a weight of guilt from Brown. Transforming guilt to regret makes possible a voice: poet, marcher in a 'legal' protest, drone victim laying in the street were deemed protected speech. The message was closely attended by the jury. Brian Hynes said, "They saw the human power of the message and the public value of the method used to deliver it. Drones kill senselessly and illegally and traumatize our airmen." 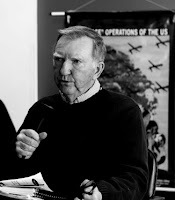 Brown said that the wars of the last decade brought back his experiences in Vietnam. “Lying in that road was the most peaceful moment I've experienced since I left Vietnam,” he said. "I was silent then in the face of those atrocities and I can't be silent anymore." The jury was smiling as they returned to give the verdict. Later one juror asked a supporter to "Thank Russell for us! My brother was in the Vietnam War and lost his leg. We know what the vets went through." The juror also acknowledged the PTSD drone pilots experience. Another juror said, "We did what was needed to be done. It was fair and just". 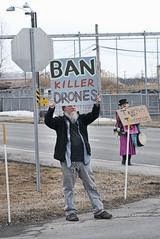 Upstate Drone Action has been protesting the Drones at Hancock Base since 2009 with bimonthly vigils, annual rallies and a Gandhian Wave of civil resistance. Because U.S. drone killings are carried out in secret -- and often never even acknowledged off-the-record -- activists at Upstate Drone Action and others around the country have been engaged in a sustained struggle to publicize the truth about the drone killings, bring about their cessation, and bring the killers to justice. Legislation now pending in the U.S. Congress would require full disclosure of the details of the U.S. killing program, but as yet only ten (10) members of Congress have stepped forward to co-sponsor the legislation, and none of those are from New York State. The trials of citizen activists in Upstate New York are part of a government plan to put a chill, once and for all, on citizens' exercise of Constitutional rights. The citizens rely on Bill of Rights protections, Constitutional provisions about civilian control over the military, and the international treaties covering conduct of war and human rights, to which the United States is a party. The position of the government is that no dissent will be tolerated, and that the severity of the penalties for expression will be rapidly escalated, until the point where dissent is cut off entirely. As indicated above, the majority of the trials (including the first) stem from protests that occurred at the end of April, 2013. A very important series of trials is proceeding in the coming weeks in a small court house in upstate New York. These trials follow in a line of previous trials of peace activists who have been working to stop the commission of war crimes by the drone kill chain, part of which is based a Hancock Air Force Base. What is particularly significant about the upcoming trials is that they are part of a government plan to put a chill, once and for all, on citizens' exercise of Constitutional rights. The citizens rely on Bill of Rights protections, Constitutional provisions about civilian control over the military, and the international treaties covering conduct of war and human rights, to which the United States is a party. The position of the government is that no dissent will be tolerated, and that the severity of the penalties for expression will be rapidly escalated, until the point where dissent is cut off entirely. On July 10, the government displayed its determination to crush anti-drones dissent by sentenching Mary Anne Grady Flores to one year in jail. Please share this information and support these defendants and the right to dissent! The trials taking place in July and August have been scheduled by the government one defendant at a time, presumably to maximize the cost to the defendants and to "make an example" of them. 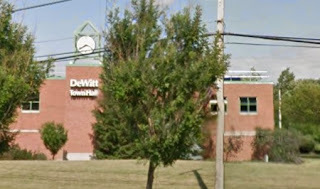 The trials listed below will take place at De Witt Town Court (5400 Butternut Dr., East Syracuse, New York). Unless otherwise indicated, each is a Jury Trial for arrest during protest at Hancock Base, April 28, 2013, and charges include Obstructing Governmental Administration in the 2nd degree PL 195.05 sentence recommendation of 1 year in jail. July 14 and 15: Jack Gilroy (H31) Read about the show trial of Jack Gilroy. July 29 and 30: Russell Brown (H31) Read about the show trial of Russell Brown. August 11 and 12: Andrew Schoerke (H31) Andrew Schoerke trial details. Charges stem from December 10, 2013 action when he joined with Creighton Chandler and Gregory Williams of Yale Divinity School to present an Order of Protection for the Children of Afghanistan at Hancock National Guard Base. Colville is charged with Obstructing Governmental Administration, Disorderly Conduct and Contempt of Court in the 2nd Degree for ignoring his own Order of Protection which protects Col Earl A Evans, who is responsible for Material Support for the 174th Attack Wing at Hancock Air National Guard Base. The OOP specified that he 'stay away' from Col. Evans' place of work, Hancock Base. Mark Colville trial details. September 14 and 15, 2014: Eve Tetaz Eve Tetaz trial details. The defendant is 87 years old. Mary Snyder trial details. December 10 and 11, 2014: Julianne Oldfield Julianne Oldfield trial details. Mahoney is acting Pro Se, i.e. defending herself. Bonnie Mahoney trial details. Consolidated Jury Trial: the defendants reside in New York City and Baltimore. Bev Rice, Joan Pleune, Jules Orkin, and Ellen Barfield trial details. April 28 and 29, 2015: Cynthia Banas Cynthia Banas trial details. May 27 and 29, 2015: Mary Loehr Mary Loehr trial details. Murray is acting Pro Se, i.e. defending himself. Harry Murray trial details. In the first of a string of "show trials" aimed at quashing First Amendment activity in Upstate New York, Jack Gilroy of Binghamton, NY, was convicted after a two-day jury trial in DeWitt Town Court yesterday. 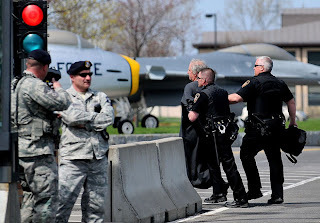 The charges stemmed from Gilroy's arrest during a nonviolent protest at Hancock Air National Guard Base on April 28, 2013. Gilroy was convicted of Trespass, a violation, and Obstructing Governmental Administration, a misdemeanor by a jury of five women and one man. He will be sentenced by Judge Robert Jokl on October 1st, a year and a half after his arrest. 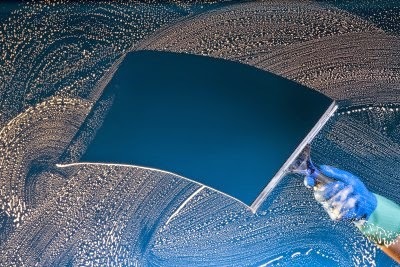 The sentence for the latter charge may be up to one year in jail and a fine of $1000. Gilroy’s Order of Protection was also reissued today as a 2 year Permanent Order protecting Commander Greg Semmel, the commanding officer at Hancock Base. Hancock Air National Guard Base, home of the 174th Attack Wing, is a domestic hub for MQ-9 Reaper drone support. It is a training site for pilots and technicians, a drone test location and an active site in the ongoing wars overseas. Heavily armed Reapers piloted at Hancock fly lethal missions over Afghanistan and possibly elsewhere. Hancock pilots also fly test flights from Fort Drum over Lake Ontario. Jack Gilroy is a nationally prominent peace activist, writer, and educator, who has worked in numerous media to communicate the truth about drone killings to other Americans. Notably, Gilroy's dramatic work, The Predator, has been performed by groups nationwide who are trying to engage in public education and debate about the wide-ranging challenges posed by drones, drone surveillance, and drone warfare. At trial, Jack Gilroy testified that he joined the Army out of high school, and was stationed in Austria in the early '50s at a time when the Cold War was hot. He says that despite a climate of distrust and contempt towards Russians, when he actually had to look a young Russian soldier in the eye during a ceremonial event, he didn’t see the evil he’d been trained to expect. Since then, Gilroy has spent 30 years as a teacher. A member of Veterans for Peace and Peace Action New York, he is currently working with Peace Action at Binghamton University to convince the college to offer a Peace Studies Program. Regarding the April 2013 protest, Gilroy testified that the boundaries of the base were unclear and unmarked at the time. He said his intention was to send a message to base personnel and the public, not to disrupt the operation of the base. Only one gate was affected by the symbolic die-in he participated in, which blocked the inbound lane of the access road. Jack was arrested and removed 30 seconds after lying in the road so he had little effect on potential base traffic. There are 11 trials scheduled for Hancock protesters in DeWitt between now and next July stemming from the April 28 protest. Several more trials are pending. (In addition, Mary Anne Grady Flores was convicted of violating an Order of Protection by standing in the road in front of Hancock Base and was sentenced on July 9 to one year in prison.) On July 30th and 31st Russell Brown will be tried pro se, serving as his own defense council, on the same charges Jack Gilroy faced today. A bill currently pending in Congress would require the administration to come clean about the killings it is carrying out with drones around the world. The bill -- the HR 4372: the Targeted Lethal Force Transparency Act -- stems from a letter issued by the leaders of the Progressive Caucus several months ago. The bill is authored by Rep. Adam Schiff, of California, and to date, ten (10) other progressive representatives have stepped up to co-sponsor the bill. This is mystifying in part because several of these same members of Congress (Clarke, Nadler, Rangel) were signatories to one of the first letters to the President demanding answers about the drone killing program, back in May, 2012. Most notably M.I.A. 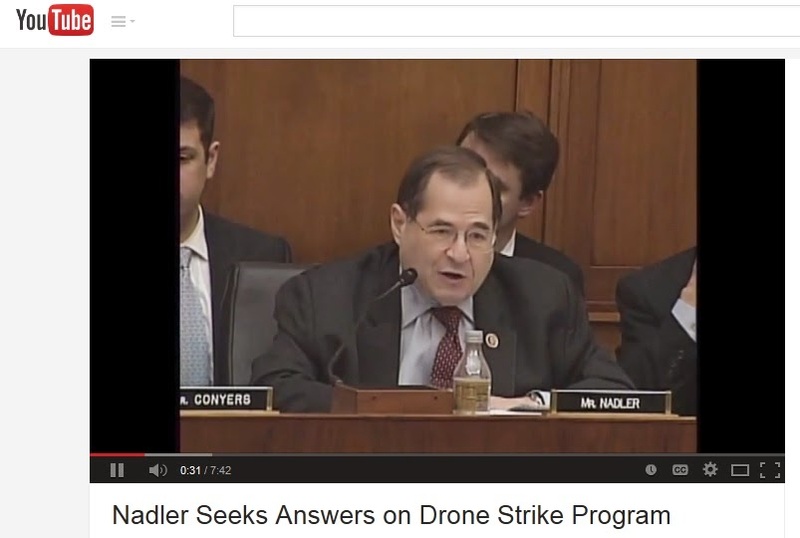 is Rep. Nadler: watch Rep. Nadler on drones during a February, 2013, committee hearing. Why hasn't he become a co-sponsor of the bill? To compound the mystery, while New York's congressional delegation sits in silence, ordinary citizens of New York have have been engaged in a sustained struggle to publicize the truth about the drone killings, bring about their cessation, and bring the killers to justice. Particularly painful is the fact that the government is putting on a series of show trials to quash dissent by citizen activists in New York State, pitting itself against their First Amendment rights, at the very moment that the people's elected representatives are abdicating their responsibility to speak out and take action. So: who -- really -- is doing the work of the people in New York State? The show trials in New York State stem from protests that occurred at the end of April, 2013. There are now TEN (10) additional co-sponsors on HR 4372: the Targeted Lethal Force Transparency Act. A very important series of trials is proceeding in the coming weeks in upstate New York. These trials follow in a line of previous trials of peace activists who have been working to stop the commission of war crimes by the drone kill chain, part of which is based a Hancock Air Force Base. What is particularly significant about the upcoming trials is that they are part of a government plan to put a chill, once and for all, on citizens' exercise of Constitutional rights. Grassroots network to stop drones killing and surveillance, for people in New York State. 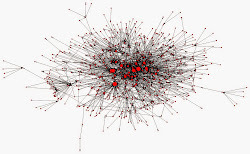 Part of the nationwide No Drones Network. 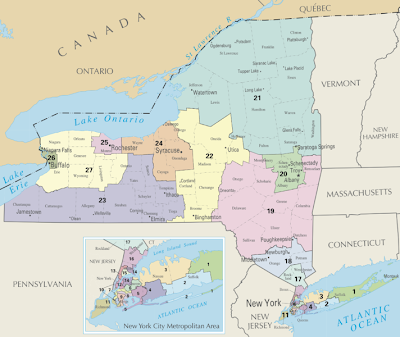 New York State's 21st Congressional District: Living Under Drones?